News & Events – Listen, Inc. Please use the filters in the right sidebar to narrow content by type of news. Listen is excited to announce the release of SoundCheck Version 17. 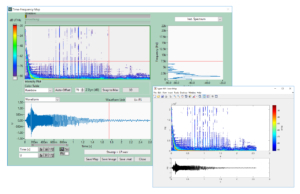 This new Windows/Mac release offers many features to simplify multi-channel and voice controlled testing, such as a new level and cross-correlation trigger, average curve/waveform post-processing functionality, the ability to easily read and work with multichannel wavefiles, multiple DC Connect control, and enhanced database options. On the usability side, SoundCheck 17 offers increased flexibility in color pallets, save to MATLAB option, and the ability to recall CSV formatted text files. Today’s modern audio devices have two important testing requirements: the ability to test a voice activated device with no analog input, and the ability to control and test multiple channels simultaneously, for example, microphone or speaker arrays. SoundCheck 17 contains a host of new features to facilitate this. For voice-activated measurements on devices with no analog input, such as smart speakers, wearables, hearables and smart home devices, the new level & cross-correlation ‘smart trigger’ offers improved performance. By using a chirp-based conditioning tone and searching for the exact log sweep frequency, it is more robust and less susceptible to false triggers than simpler level and frequency triggers. 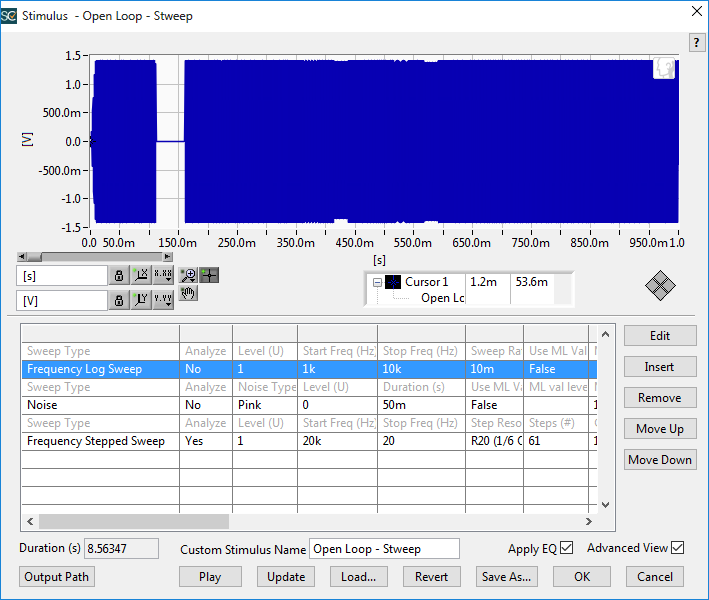 To save time when testing smart devices where it is necessary to test microphone or speaker arrays, SoundCheck 17 can now directly read multichannel WAV files from the memory list, signal generator and stimulus steps. Also for testing multi-channel arrays, multiple DC Connects can now be controlled, independently configured, and used for data acquisition within SoundCheck. The new Average Curve/WFM post processing function which allows the average curve (or waveform) of a selected group of data in the memory list to be obtained, is particularly useful for power averaging selected curves, averaging curves from different spatial positions (e.g. microphone arrays), and complex averaging of multiple measurements with background noise. Finally, the database module has been enhanced and is now it 4x faster and 3x more space-efficient than previous versions. This is particularly important for testing modern audio products with multiple transducers (microphone arrays, multiple speakers, etc. ), as these often generate large volumes of data. Usability enhancements include improved color pallets which offer ultimate flexibility in defining colors for backgrounds, grids, cursors and graph lines. New default color palettes are included, and user-defined palettes can be saved as pre-set files which will be applied to any new display created. Multiple palettes can be saved, for example allowing different color sets for different applications. In addition, SoundCheck can now save any data (including memory list curves and Soundmap (time frequency analysis) data ) to MATLAB for additional processing. Data is saved as a standard MAT file and can be manually or automatically saved in this format. Additional new features include support for the new APTX HD codec for high resolution Bluetooth testing, a 64 bit Demo / Data Viewer which enables measured data to be recalled and viewed without the need to own a separate license, and the ability to recall CSV files as well as TXT files. For a limited time we are offering deep discounts on a system upgrade to enable you to get up to date with the latest version of SoundCheck. The upgrade offer is a simple flat rate: $3,950 for owners of SoundCheck 11 or 12, $3,250 for owners of version 13, $2,500 for owners of versions 14 through 15, and $1,395 for owners of version 16. All the modules on your present system will be included. Improved color pallets for ultimate flexibility in defining colors for backgrounds, grids, cursors and graph lines. Save to MATLAB – All data including memory list curves and Soundmap (time frequency analysis) data can now be saved to MATLAB for additional processing. Data is saved as a standard MAT file and can be manually or automatically saved in this format. An enhanced database (optional module) is now 4x faster and 3x more space-efficient than previous versions, making it an extremely powerful data management tool for customers testing modern audio products with multiple transducers (microphone arrays, multiple speakers, etc. ), as these frequently generate large volumes of data. A new Average Curve/WFM post processing function allows you to obtain the average curve (or waveform) of a selected group of data in the Memory List. A 64 bit demo / data viewer replaces the 32 bit demo version. When the software key is not installed, previously measured data can still be recalled and viewed. CSV formatted files can be recalled in addition to TXT files. Call your sales engineer today to receive a quote for upgrading all your SoundCheck systems. These discounted rates are only available until May 31st, 2019, so order today! If you are using a version prior to version 11, please contact your sales engineer for discounted price information. Effective Jan 01, 2018, versions of SoundCheck prior to version 13 will no longer be supported. We highly recommend that you take advantage of this limited time offer to upgrade your systems to version 17. Please contact your sales engineer to discuss additional multi-system upgrade discounts. If you have multiple systems with different purchase dates, we are happy to work with you to get them all upgraded to the latest version and onto the same annual support contract cycle. You can also reduce your future upgrade costs by purchasing an annual support contract for an additional $950. With this, you will receive SoundCheck 18 when it is released at no extra charge, as well as priority support service. Please note that these prices are applicable to the US only. Users outside the US should contact Listen or their local representative for pricing information. Please fax your purchase order to 617-556-4145 or email it to sales@listeninc.com, or contact us on this email address if you would like to pay by credit card, have any questions, or need additional paperwork to support your order. Please also see the detailed information on new features. We are excited to announce our first major SoundCheck training event in Denmark in Copenhagen on May 1-3, 2019. This two-day class is designed to accelerate the learning curve for novice and basic level SoundCheck users. A combination of teaching, demos and hands-on exercises begin with the basics of system setup and calibration, using virtual instruments, and creating and modifying basic test sequences. On the second day, the sequence writing progresses to more complex techniques such as sequence loops, statistics and advanced post-processing. This is designed for users who have already attended the basic class or who need to make more complex measurements and want to take their SoundCheck use to the next level. This course will include topics such as simulated free field measurements, open loop testing of smart devices, advanced distortion measurements, selecting an appropriate test stimulus (including speech, music and compound stimuli), advanced sequence development including conditional branching and looping, advanced post-processing algorithms and more. Scroll down for full class outlines. 5+ will receive a 25% discount. Note: to qualify for the discount, all attendees must register together, but do not need to attend the same days. 2-Day Basic SoundCheck Training: Class Outline. Wednesday May 1st & Thursday May 2nd. In this class, we start with the basics – how to set up your system, calibrate your hardware and use the virtual instruments. We then focus on how to develop and modify test sequences, starting with stimulus, analysis and display options, and progressing to more advanced functionality such as sequence loops and jumps, statistics, and advanced post-processing. The class is a combination of classroom-style teaching and hands on practical sessions, so that when you leave the class you will be ready to go in practice as well as in theory. Note: This is intended as a 2-day class, but each day may be taken separately if wanted. The first day will focus more on setup, calibration, virtual instruments and some beginning sequence writing. The second day will focus on sequence writing in much more detail. 1-Day Advanced SoundCheck Training: Class Outline. 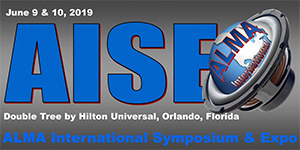 This years AISE (ALMA International Symposium & Expo) will be held on June 9-10 in Orlando, FL. Listen will be showcasing its suite of audio measurement equipment for measuring smart speakers, wearables, smart home audio, hearables and automotive audio, as well as conventional transducers such as loudspeakers, headphones and microphones. In addition to exhibiting, Steve Temme will present a half-day seminar on smart speaker testing. This informative and educational seminar will discuss the challenges of testing smart devices such as smart speakers, smart home devices, wearables and more, and demonstrate various methods of testing such devices. 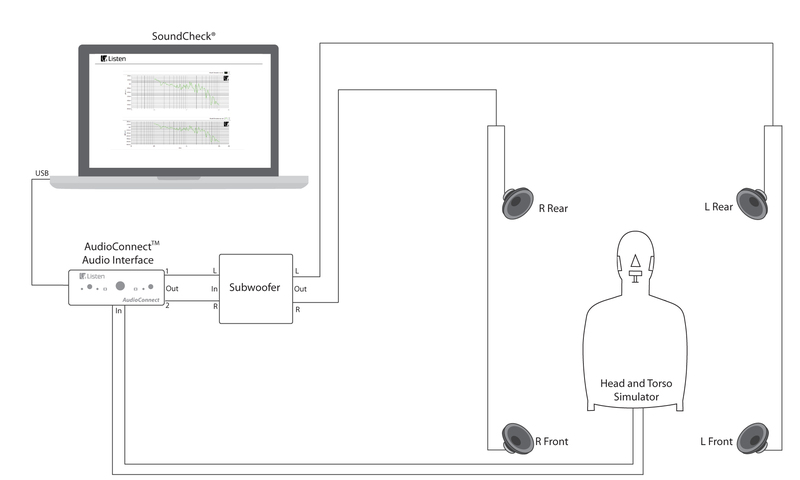 Steve Temme will also present a paper on testing smart hearable devices, and Les Quindipan will demonstrate automotive audio testing using the Mentor A2B interface with SoundCheck. 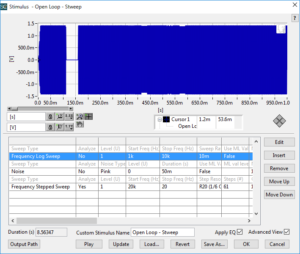 Listen, Inc. has launched the ETSI standard background noise generation module, a SoundCheck test sequence which calibrates a 4.1 speaker array to conform with the ETSI ES 202 396-1 Standard. This provides an equalized, calibrated playback solution to stress devices in a standardized and repeatable way. The sequence includes a library of real-world binaural recordings from the ETSI standard: cafeteria, pub, crossroad, vehicle, single voice distractor, and office noises. Custom or user-defined binaural recordings can also be used. With a purchase price of just $5,000 for the test sequence, this offers an extremely economical alternative to a conventional $20,000+ stand-alone background noise generation system. Furthermore, it offers the advantage that the ETSI standard library is fully integrated with, and managed by, the SoundCheck test system. This means that the calibrated background noise levels can be fully controlled and adjusted as part of a pre-programmed test sequence, significantly reducing test development time as well as simplifying the physical setup. This has many applications, for example evaluating ANC, noise suppression, SNR optimization of microphone arrays, beamforming directionality studies, and more. It is particularly useful for voice recognition testing as the test sequence may include loops to incrementally increase the volume or change the noise and repeat the test until the voice is no longer accurately recognized. Your devices got smarter. Did your test system? 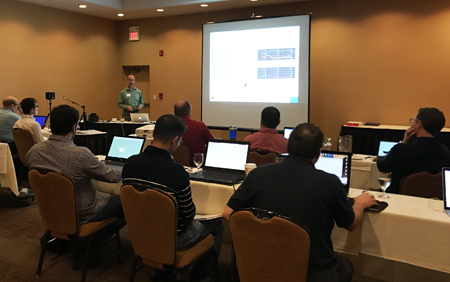 Learn how to implement open loop tests for both playback and recording in a range of devices including smart speakers, automotive audio, robots, IoT devices and more in this practical seminar. 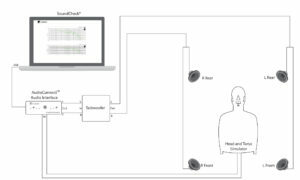 Stimulating and capturing responses from a device where you don’t have direct access to the microphone or speaker (open loop testing). Speakers /主讲人: Steve Temme, Listen, Inc. and Peter Wulf Andersen, GRAS. Listen is excited to announce its biggest ever training event on the West Coast the week of Feb 4th– 8th (Chinese New Year week) with 5 full days of training events. Monday Feb 4th: Electroacoustics training with Chris Struck. This one-day course covers the fundamentals of electroacoustics and is ideal for anyone new to the industry or who wants to learn more about the electroacoustics theory behind the measurements they are making. You do not need to be a SoundCheck user to benefit from this class! Course Outline. Register. Friday Feb 8th: Smart speaker testing seminar (half day plus networking lunch). 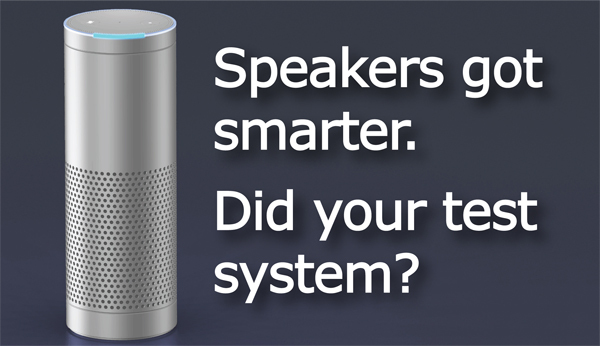 By popular demand we are bringing our free smart speaker testing seminar back to the West Coast. Steve Temme will present this seminar covering many aspects of smart device testing including open loop measurement, telephony measurements and voice quality measurements. Although the demonstrations will be done with smart speakers, the techniques and methods are relevant to anyone testing voice-controlled devices including hearables, watches and other wearables, robots, smart home devices and automotive entertainment systems. FREE. Course Outline. Register. Location: Hilton Garden Inn, 10741 N Wolfe Rd, Cupertino, CA 95014. Note: to qualify for the discount, all attendees must register together. 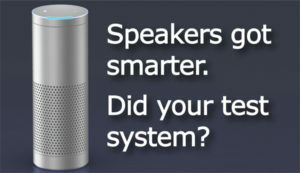 Multi-attendee discount is only applicable to Mon-Thurs training since the Friday Smart Speaker Seminar event is free. This is designed for users who have already attended the basic class or who need to make more complex measurements and want to take their SoundCheck use to the next level. This course will include topics such as simulated free field measurements, open loop testing of smart devices, advanced distortion measurements, selecting an appropriate test stimulus (including speech, music and compound stimuli), advanced sequence development including conditional branching and looping, advanced post-processing algorithms and more. WE are finalizing content and a more detailed outline will follow shortly. Learn how to test smart speakers, hearables, watches and other wearables, robots, smart home devices, automotive entertainment systems and other smart devices in our practical half-day seminar taught by industry expert Steve Temme of Listen, Inc. Although acoustic testing of smart speakers and other voice-activated devices presents challenges such as injecting and extracting response signals, time delays, and triggering the system using voice commands, it is still possible to measure the same parameters as traditional loudspeakers, In addition we can also measure microphone array performance, speakerphone performance and more. There is no charge for this seminar and lunch will be provided. 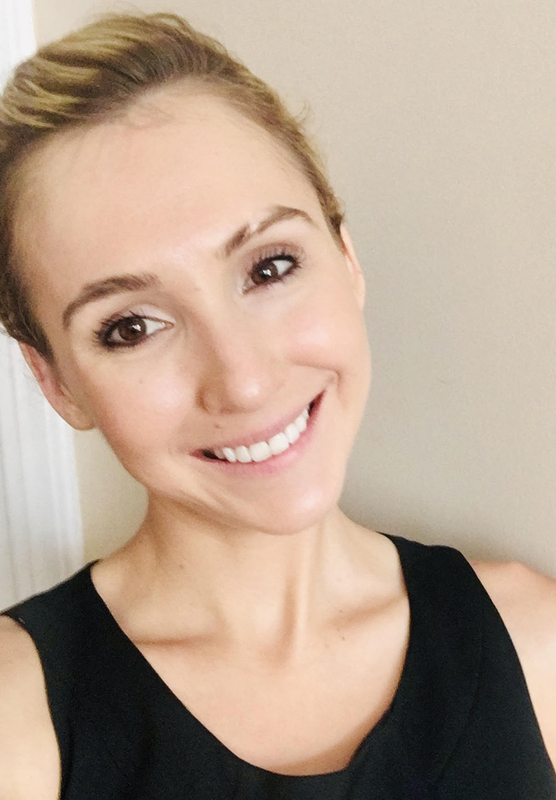 Listen welcomes Renee Jolie Bartel to the Operations team, where she will be working as Sales and Marketing Administrator. With previous experience at Thomson Reuters and The Marketing Arm, she looks forward to supporting Listen’s efficiency and creating infrastructure, working as a liaison between teams. She has a degree in Social Sciences from University of Washington and completed post graduate work in pre-medical sciences at Columbia University, where her interest in marketing was stoked through student organization leadership and recruitment. She has worked on campaigns for Frito Lay, Bacardi, and helped create guidelines for greater accessibility and compliance with ADA legislation. She is passionate about music, especially in the ways it impacts human physiology. Outside of work, she enjoys yoga, sailing, hiking, and traveling.